With apologies to Shakespeare, I was reminded of his line in Hamlet when a potential suitor recently showered me — or more like drowned me — in texts. Once we’d exchanged a few emails and he secured my cell phone number, he began his texting campaign — before we’d even spoken! When he asked when I’d be available to speak, I told him from 8-10 p.m. the following day. So that morning, his assault started. Two bromide-laden messages appeared at 9:20 — during a client call. Throughout the day I received 8 more. Meanwhile, he called me at 11 and 2:30 — both during my business day and I was in meetings so I let it go to voice mail immediately. What part of “8-10 pm) was confusing? He sent a few more texts then called in the evening. We talked briefly and it was a bit awkward. Afterward he sent me three texts telling me he enjoyed our talk. Since I send and receive very few texts, I’m on a 200/month plan which is more than adequate for the few “I’m on my way” or “I’ll be a few minutes late” texts to pals. So I emailed him that evening a message to please not text me unless it’s an emergency. The next morning his text awakened me at an hour before my usual waking time. Now I’m ticked! His message: “Rise and shine!” How assumptive that I was up — or wanting to be so — rather than enjoying the last REM to be fully rested before a full day. Plus, was he obtuse? Did he not understand that I didn’t want to be texted? So when I was fully awake, I texted him asking if he got my email about texts. It took him two texts to say no! The texts have now stopped as well as the emails and calls. This man was too different in communication preferences for us to be a match. Want to understand more clues he’s worth going out with — or not? 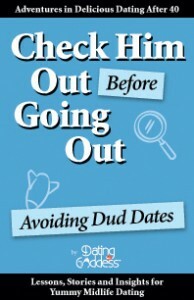 Get your copy of Check Him Out Before Going Out: Head Off Dud Dates. He sounds really clueless and also very emotionally needy. To text you that many times ? Big ugh 🙂 I, like you, ran from men like this. What is the goal here? Why all these rules? So what if someone texts too much, are you looking for reasons to ‘next’ a date? Rules? I don’t think she is spitting out rules, rather common sense and respect is all that is being asked of. He ignored her polite request to not text. That number of texts is ridiculous and almost stalkish. I agree sounds like a scammer or serial dater. NEXT! I didn’t see anything more then when she told him she would be available. And it is obvious (unless the guy was a scammer), he was wayyyyy too freakin needy. Love this blog, thank you for all your advice and tips!